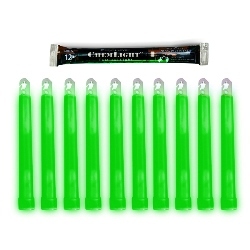 Cyalume Military/Tactical Chemlight 6" Light Sticks are the gold standard in chemical light technology. They are the issued as the standard issue for all military personnel. There is no better emergency light alternative out there. There are 8 hour and 12 hour lightsticks along with half hour hi-intensity lightsticks and IR lightsticks. They are the most reliable source of light in an emergency. They are safe and non-toxic with no batteries or flames involved. Cyalume light sticks have a shelf life of 4 years and are made in the USA.